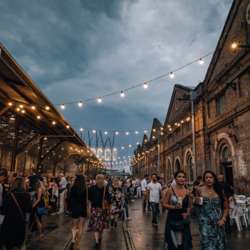 TL;DR - meet at Protected content at 7 to enjoy an evening of food, drinks, and wine at the iconic Carriageworks. Book tickets and sign up for the event. Acclaimed chef Kylie Kwong returns to curate the Summer Night Market with a line-up of over 60 stalls from Australia’s best chefs and producers. Drawing inspiration from Nick Cave’s installation UNTIL, the Night Market celebrates community and story-telling, featuring locally-sourced dishes, live music, DJs and cooking demonstrations.